Happy MLK Day everyone. I too have a dream. I’m very serious about the whole starting a nano-brewery thing. I dream about it every night. Some days it’s all I think about. There is so much to learn and figure out. I’m almost done reading the Tennessee Department of Revenue’s Alcoholic Beverages and Beer Tax Guide and have been talking to people to clarify things I don’t understand. I have the Tax and Trade Bureau’s website bookmarked and read it constantly. I still have to register my trademark and I have the US patent office’s website in my favorites. I am always checking the Brewer’s Association website and look forward to the day I can join that organization and announce to the world that I am officially “a brewery in planning“. Next thing I plan on studying is OSHA regulations. Right now the thing that seems to be holding me back from applying for permits, getting my trademark registered, etc is finding a location to set up. I have a very limited area I am looking at, all within walking distance of downtown. I don’t need something big, just enough space to build an office, brewing area, cold storage, fermentation room and the actual bar area/ tasting room. I need something affordable, which unfortunately rules out most of downtown. I like the Fourth and Gill area. That neighborhood is needs a small bar. I’ll keep looking. Craigslist, news paper, word of mouth, friends and driving around searching. Once I DO find a spot (and I will) then the fun begins. Negotiating lease terms, making sure it’s zoned right, inspections and construction, the actual raising of funds and the mountains of paperwork. I KNOW it is going to be hard and test the limits of my sanity, but dammit, I am completely dedicated. Once I find a place I plan to go from living in a comfortable house near downtown with a killer view, to basically being a couch surfing & urban camping brewer. This is because I’ll need the money going towards my house to use for the commercial space. If I have to basically live like I’m homeless to see my dream take off, so be it. Until then, I have updated a few things on my website. I finally put together a bare bones store page to sell the shirts and other stuff that I have for sale at the various beer festivals I attend. It’s a work in progress and I currently only have a fraction of my merchandise on there. I’ll post more as I can. I also put together a brewery wish list. People are always asking what they can do to help. I have people asking if I need investors. Yes, I do. However I am not going to start actively soliciting donations or raising funds until I have my location on lock down. I put together the wish list mainly for myself, to have the satisfaction of crossing things off the list as I acquire them as a measure of my progress. Also there is part of me that hopes that there are people out there who happen to have spare equipment, knowledge or insight and can help me cross these things off. 24 pounds organic 2 row brewer’s malt. Yeast- 1/2 gallon starter of Safale S-04 Whitbread English strain. Cool rapidly to 65 degrees and pitch yeast. 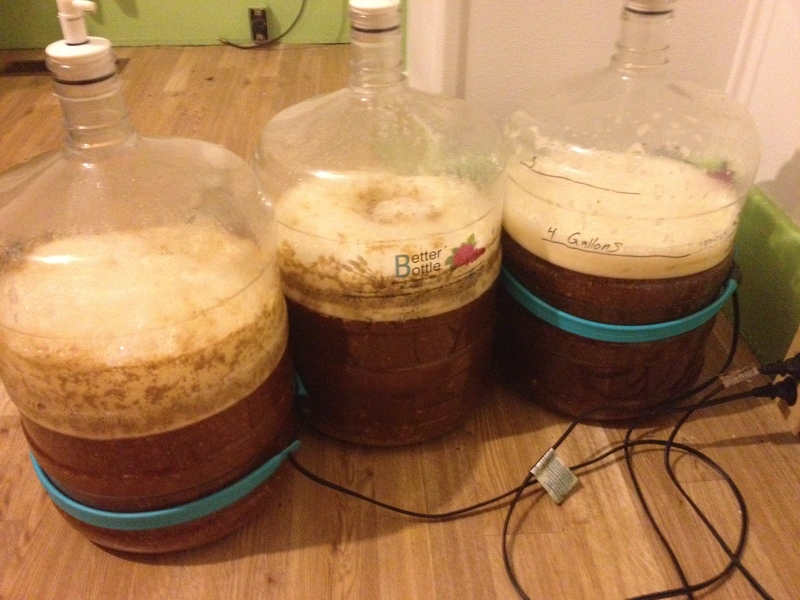 I split into 3 carboys for fermentation, roughly 11 gallons fermenting away. 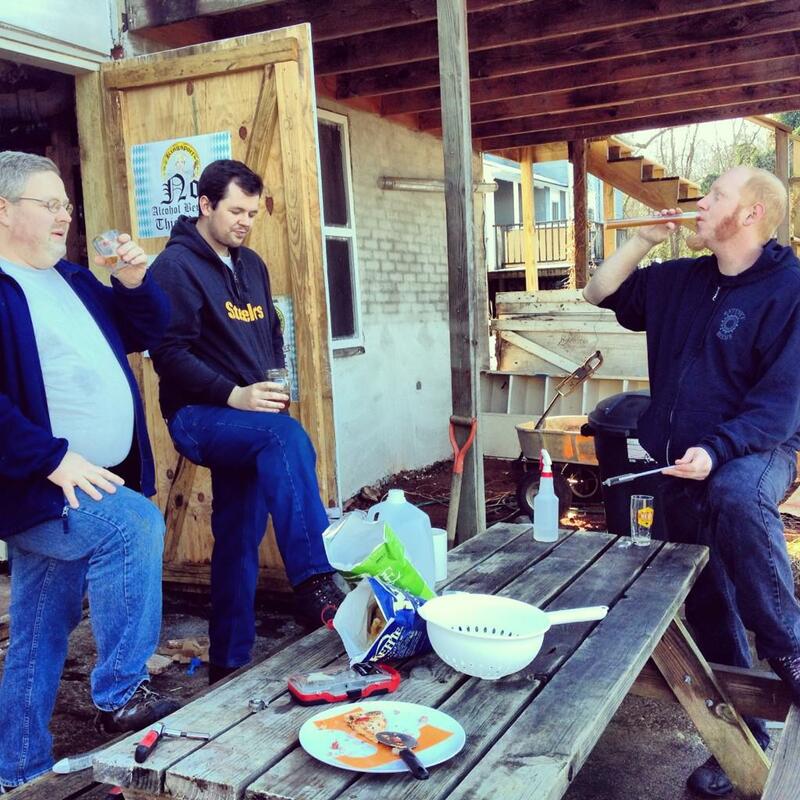 Richard, Todd and myself sampling some unfermented Hop Blitz after clean up. This weekend I’ll be in Asheville for the Winter Warmer beer festival. Expect a post afterwards. If you are going, and we haven’t met, feel free to introduce yourself. For you Knox Beer Crew guys and gals going, what do say we go to Wicked Weed for dinner afterwards? This entry was posted on Monday, January 21st, 2013 at 18:07 and is filed under #AvlBeer, #knoxbeer, Asheville, Beer Books, Beer Recipe, Craft Beer, Drinking, home brew, home brewing, Knox Beer Crew, Knox Beer Week, Knox Brew Fest, Knoxville Beer, Knoxville beer blog, Knoxville Beer week, Knoxville Nano Brewery, nano-brewery knoxville, Ratchet, seasonal, starting a brewery, Tennessee Beer Festival, Tennessee Winter beer fest, Uncategorized, whole hops, Winter Warmer. You can follow any responses to this entry through the RSS 2.0 feed. You can leave a response, or trackback from your own site. One Response to Happy MLK Day everyone. I too have a dream. 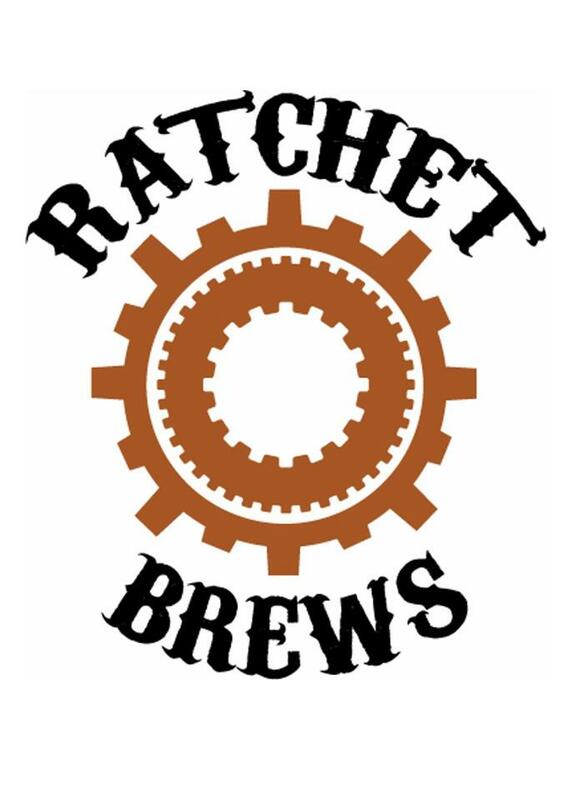 Ratchet, you should find out who owns a lot of commercial real estate in the fourth and gill area. They may be able to work out a flexible lease rate/build out for the right business plan. If anyone has the passion to make this happen, it is you.